Kerry Esmond is a graduate of Texas State University with a degree in Industrial Technology. He has worked with Rilco Manufacturing Company, Inc. (www.rilco.com) since 1989 in various disciplines within the company, including the following: production management, estimating, procurement, project management, and is currently the Senior Vice President of Sales. With over 20 years of experience directly involved with pipe supports and associated projects, his experience includes: technical and commercial knowledge of all types of pre-insulated and non-insulated pipe supports and springs, performing pipe support design evaluations and suggesting improvements, providing jobsite solutions, workforce installation training, assisting with client specifications, and evaluating pipe support insulation cost and efficiency. His technical expertise in the pipe support field is valuable to designers, engineers, architects, as well as construction entities and jobsite personnel. He may be reached at kesmond@rilco.com. One of the most significant concerns for any plant engineer is how to save energy and operating costs. One way is by utilizing the appropriate pipe support components within the plant’s piping system. Choosing the wrong type of pipe supports can lead to extremely high costs, heat loss, corrosion under insulation (CUI), and a host of other issues. These problems can be resolved by choosing an appropriate insulated pipe support for your system. One option is pre-insulated pipe supports. Pre-insulated pipe supports are used in a variety of applications, including above-ground piping and piping in buildings, tunnels, and trenches. They can be designed for high-temperature, cold-temperature, and even dual-temperature applications. High temperature pre-insulated supports utilize structural inserts within the support for load carrying and clamping capabilities. Low-temperature supports use various materials and densities to carry the load of the pipe. 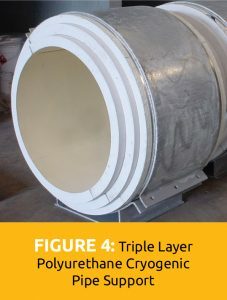 Composites of several different insulations such as aerogel blanket, calcium silicate, cellular glass, and closed-cell foam insulation may be utilized for special applications at a wide range of service temperatures. Pipe supports that clamp or weld directly to the pipe have documented inefficiencies. As an example, thermal analysis performed by infrared photography on a high-temperature pipeline (see Figure 1) indicated that significant amounts of heat from this pipeline were being transferred from the pipe to the uninsulated steel pipe support welded to the bottom of the pipe. This caused a great deal of heat to escape into the pipe rack and the environment, affecting the surrounding area as well as inefficiently releasing BTUs of energy at the pipe support locations, thus negatively affecting the performance and efficiency of the pipeline. Pre-insulated pipe supports help isolate the pipe from the outside structure for maximum efficiency. They offer an immediate thermal break and eliminate “radiator fin” heat loss or gain, depending on the service temperature of the system. 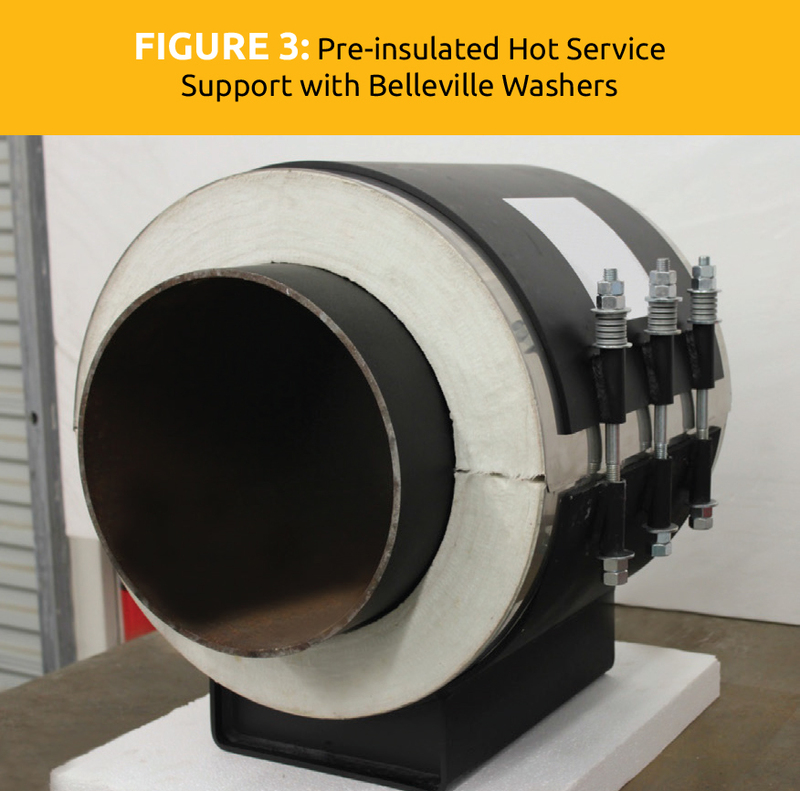 Pre-insulated supports function to keep heat in or out of the pipe as desired depending on the service temperature of the pipe. 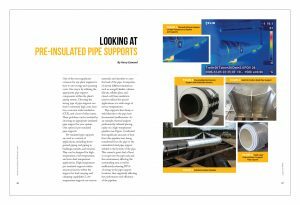 Another approach to pre-insulating a pipeline is by “modularizing” the piping system using sections of pipe that can be pre-assembled with insulated supports, insulation, and cladding at an offsite location. This system approach minimizes laydown space issues and significantly reduces labor time, resulting in cost savings for the project. 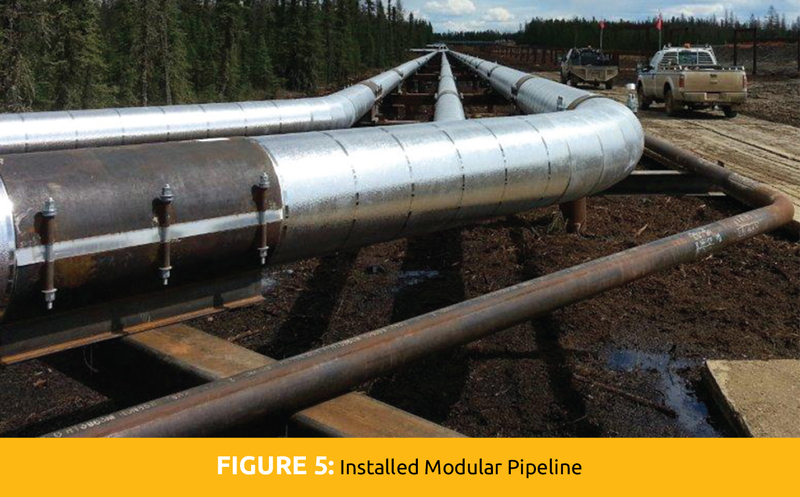 These “piping modules” can be conveniently installed on the pipeline with all of the piping components already in place. Additional benefits include an improved project schedule, safe working conditions at waist-high levels, decreases in scaffolding, and overall construction cost savings. Pre-insulated pipe supports can offer easier installation than non-insulated supports in some cases. 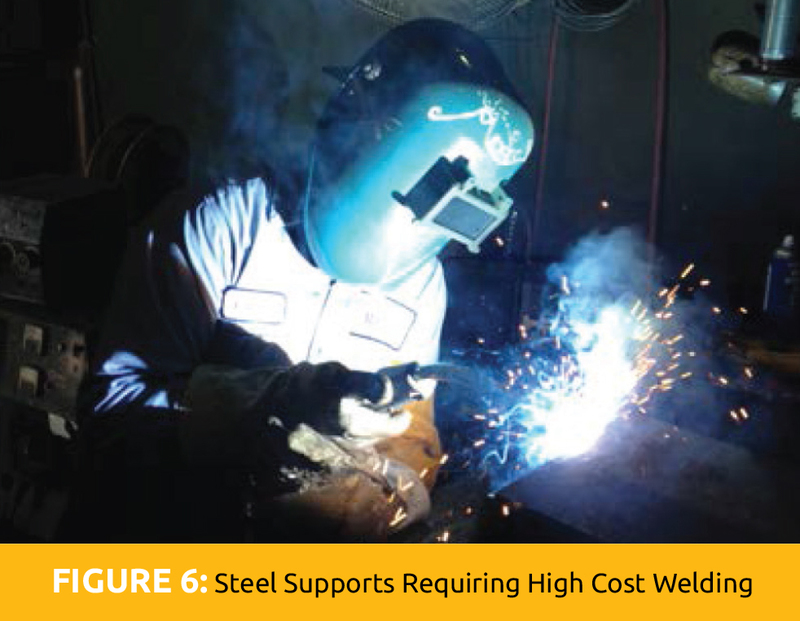 Weld-on supports require expensive labor rates for time-consuming welds, along with additional inspection time by quality control. It can be laborious to trim the insulation and jacket around the steel ribs of the support. Meanwhile, pre-insulated pipe supports bolt on to the pipe for fast and secure installation. After bolting, the installation is complete as the insulation and cladding are part of the entire installed unit. 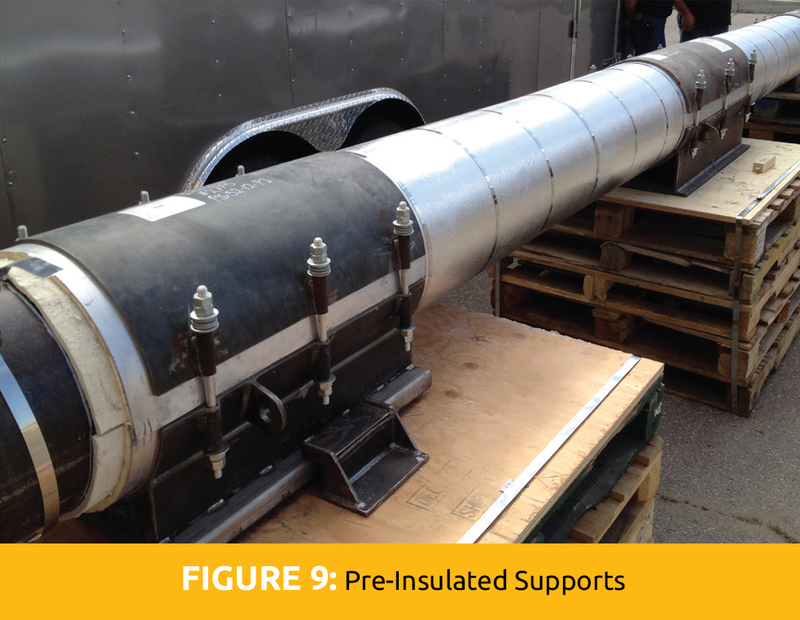 In some cases, the reduction in labor cost more than makes up for the higher material cost of a pre-insulated pipe support. CUI and pipeline condensation are issues that can occur on a pipeline. 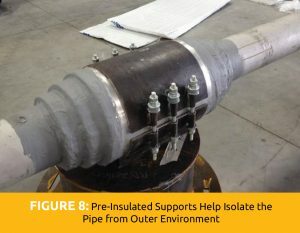 Pre-insulated pipe supports totally isolate the pipe from the outside structure and can include a sealed vapor barrier and line stop system to eliminate these types of issues at the pipe support locations. 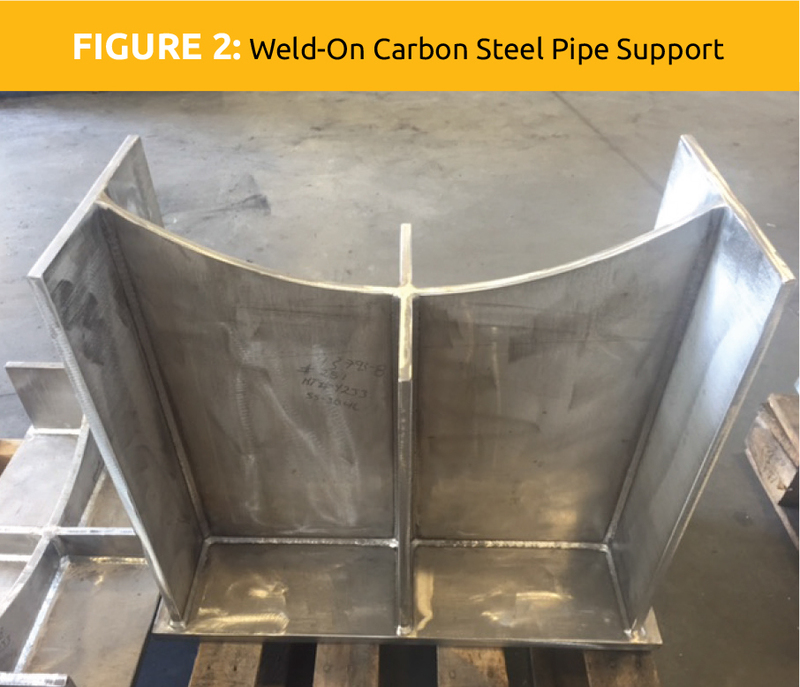 There are many factors when choosing between uninsulated weld-on and clamp-on supports or pre-insulated pipe supports. 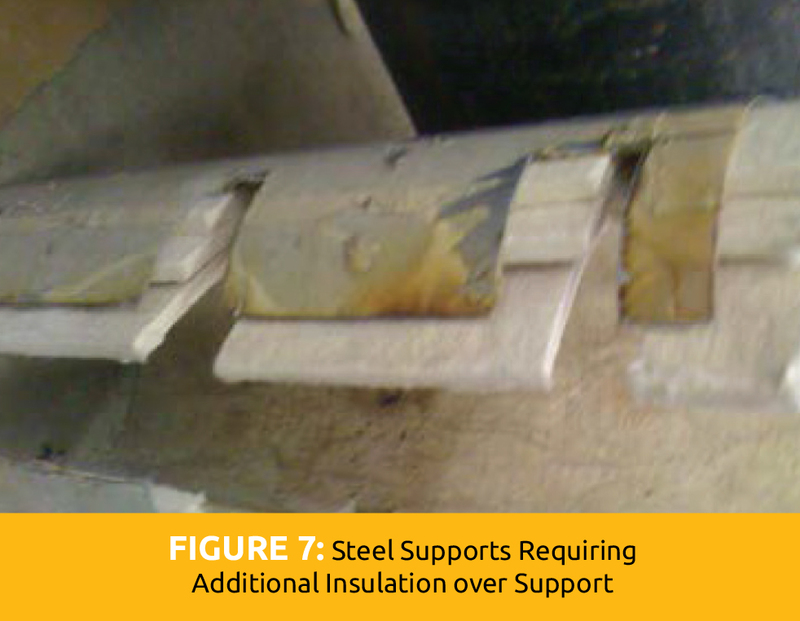 Supports must be properly insulated to save on operating costs, time, pipeline efficiency performance, and to protect against serious damage to the pipeline throughout the lifetime of the plant.